I wrote this in the first life writing group I facilitated (and the first I participated in, as well). We followed the methodology laid out by James Birren in his book Telling the Stories of Life through Guided Autobiography Groups. Session 6 prompted us to write on the theme of “Your Sexual Identity.” The following is lightly adapted from the essay I wrote in July, 2004. A fair amount of my energy as I entered my 20s went toward finding some alternative to domesticity and the nuclear family model. I had been interested in communal living since my first exposure to hippies. In face I wrote a paper surveying communes for a high school English class. And in 1981, when I was 25, I went to visit one. With me was my potential husband Jim. I met Jim when I made the decision to go back to school in commercial art. To cut costs, I applied to live in a cooperative house. Jim was another of the applicants, and we met at a group interview. He says I caught his eye then. We were both accepted into the house, and in a matter of months I was turning down my other lovers and snuggling down with my new friend and roommate. In a few months more I was realizing his love for me was a jewel of great worth. Maybe we should cast our lots together. But where? And how? 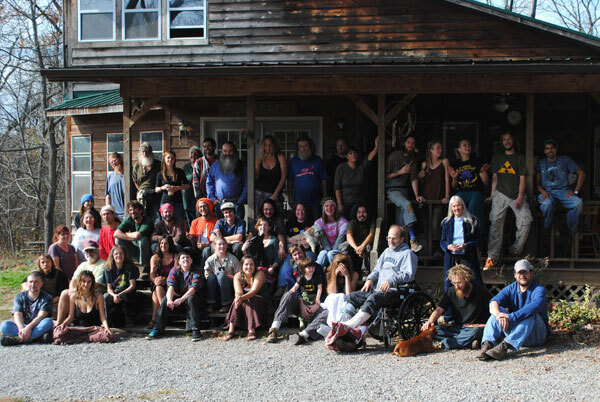 The co-op house we lived in had ties to East Wind, an intentional community on 1000 acres of Ozark hill country. Brearly House functioned as a sort of “halfway house” between the real world and the co-op world, and it followed the same rules and customs as the mother ship. One of the things that appealed to me most as I learned about East Wind was their ideas about parenting. They took political issue with the idea of the 2-parent family. House rules forbade bringing a child into the commune without 3 parents signed on to raise it. A breeding pair had to find a third friend willing to play a very hands-on version of the “godparent” role. I liked this idea a lot. The thing that scared me most about parenting was the possibility I would at some point find myself alone, a single mom. The East Wind plan with its handy back-up parent seemed like a good solution. I thought maybe I could take on love, marriage and the baby carriage if I tried it there. So when spring break came in 1981, Jim and I headed down to East Wind to check it out. It was our first trip together. I love to travel. I did not know yet that Jim did not. We got on a train in Madison which took us to Chicago, then Saint Louis, where we switched to a bus and continued on to East Wind on the Missouri-Arkansas border. It was about 10 pm when the bus let us out at a bowling alley at a crossroads in the middle of nowhere. We went inside to find a phone to call our hosts for pick-up. That’s when I realized I didn’t have the phone number of the place on me. It’s impossible, it turns out, to ask directory assistance for a phone number when the place you want to find is far outside any town and straddles a state line. Jim is a very sweet man who will do almost anything to humor me, even if doing so makes him miserable. The only catch is, he is unable to hide his misery. And he was very miserable at that moment in the bowling alley. I do not like public yelling matches but that’s what we did. Somebody at the bowling alley overheard us, and he knew somebody and somehow the phone number was gotten and the truck came down from up-country and delivered us to the commune. The East Wind Community has a protocol for visitors, particularly those considering applying for residence. We would be given a tour of the community; we would be perform work jobs; and we would socialize with the community’s members. One individual, in our case a slim red-headed man named Chad, would be assigned as our cultural interpreter. The next morning Chad took us on the tour after breakfast in the dining hall. First the lodge, with its kitchen, dining, and shared living spaces. Then the dorms, long buildings like chicken coops with tiny spaces for each resident, about 6’ x 8’ with a sleeping loft above and a desk below. No clothes closets—no need. In the next building was the communal clothes cupboard, laundry and shower house. The tiny private rooms didn’t bother me but the thought of communal clothes did. “What if you have a favorite piece?” I asked. “You can keep it for yourself it you really want to, but it’s discouraged,” replied Chad. I couldn’t help thinking about my size. What if the only fat pants were gone when I got out of the shower? This communal life might be trickier than I realized. Next on the tour came the workshops. The community earned an income with handmade products, nylon rope hammocks and “utopian sandals” made from recycled tires. But both of these involved some toxic processes, and the community had recently invested in a new, more eco-friendly enterprise: nut butter production. A large shed had been built to house the roasting equipment and packing lines. Three butters were made and distributed to grocery co-ops around the U.S.: peanut, almond, and cashew. “When we’re doing peanut butter, the whole place smells like the circus,” Chad said. 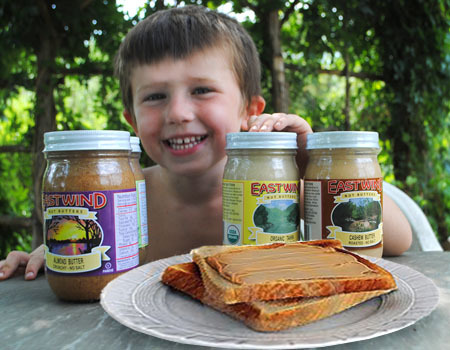 The nut butters were the second reason, after the 3-parent thing, that I got excited about East Wind. I was set on a graphic art career. Not much use in a farm-based commune. But here, I could put my hand to marketing the nut butters. Chad’s main work was being the marketing guy. I confided eagerly that I would want to work for him if I came here to live. Over the next few days we socialized, hiked around the grounds, and did our work jobs. Being a professional chef, Jim of course went to work in the kitchen. He baked off great stacks of cashew-butter cookies to feed the 50-plus residents. He was a popular guy from that moment on. Me, I went to work in a different way. I offered to share my women’s spirituality path with East Wind’s women. I announced I had brought a tape of my teacher Selena Fox lecturing on the nature religion of which she was a practitioner and advocate. I posted a time and place for playing the tape and a discussion to follow. As it turned out, this was an extremely impolitic idea. About a dozen women came to the session. That left several dozen other residents male and female to wonder what seditious ideas I might be spouting, what cult I was recruiting for. Where Jim’s cookies bought love, my fireside religious chat earned a very cool reaction. Chad, who had been friendly about my future in peanut butter packaging, was suddenly hard to find and aloof when I did find him. Jim was growing noticeably cooler toward me as well. Chad assigned us our next work job: cleaning out a brown and leafless flower bed on the hillside behind the dining hall. Jim and I worked at it in sullen silence. It was time to talk but he wasn’t about to. So as I bent to the task of pulling out dead tangles in the weak spring sun, I carried on the debate with myself. Live here on the land or no? Stay with Jim or split up? Was it coming down to a choice: I wanted to stay, but Jim did not? Jim, of course, passed with not a crumb of doubt. I, on the other hand, was invited to leave. I had been upsetting people. The next morning we were delivered quietly back to the bus at the bowling alley. We quarreled the miles away like an old married couple. By the time we neared Saint Louis, the irritation had spread from emotional to physical. That flower bed Chad asked us to clean out? The poison ivy patch. We distracted ourselves from our pain with argument on bus and train and taxi until finally we were back on the doorstep of our very own halfway house. Jim turned sunny then, as we painted each other with calamine lotion and told our housemates about our trip. It is always like this with him, and I can say that because we’ve been married 21 [now 31] years. This entry was posted in Sarah's memoir and tagged East Wind Community, travel. Bookmark the permalink.